Taylor Krupiak is a nursing student in Philadelphia, where she is a senior in the BSN program she attends. She also works as a Nurse Extern in the Emergency Department of her hospital. When she finishes nursing school, Taylor hopes to begin working in an ICU and go on to anesthesia school to become a nurse anesthetist. 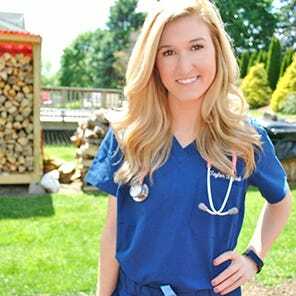 Outside of nursing, she loves running and sharing her advice and experiences in nursing school on her blog! "Nursing requires someone to be knowledgeable yet also caring. You take care of patients as a whole. In nursing, we look past just their medical condition. That is what I love about nursing. I love getting to know my patients and seeing them heal. The biggest challenge thus far has been balancing school and work! Professional style is very important to me. I feel that how you look expresses who you are as a person. Sometimes in health care we don't get to have as much options with our clothing as other professions. I want to be able to do my job and feel comfortable in the scrubs I wear while doing it." Follow Taylor on Instagram and visit her blog at TheFutureCRNA.blogspot.com.